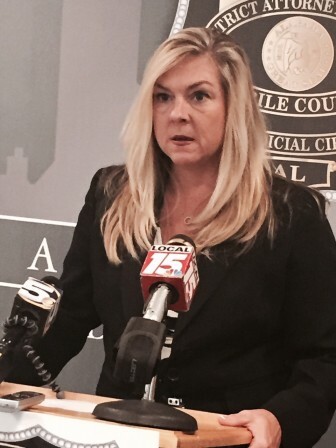 After a costly five-year lawsuit, District Attorney Ashley Rich has reached a settlement agreement with two Mobile County commissioners that will permanently increase the funding for her office and employees. The agreement, which was signed by commissioners Jerry Carl and Merceria Ludgood on Monday, was finalized by Judge George Elbrecht earlier today. In addition to a one-time, $1 million payout, the settlement also increases the county’s annual appropriation to the District Attorney’s office to $2.7 million. The new figure is an increase from the $1.5 million allocation the office has been receiving but less than what Alabama’s Supreme Court ruled the office was lawfully due in 2016. Rich’s lawsuit began and ended with a pair of local laws passed in the 1980s that required the Mobile County Commission to match salary increases for her office passed at the state level, as well as the regular cost of living adjustments granted to all county employees. Though Rich and her employees are state employees prosecuting state crimes, most district attorneys offices in Alabama receive money from the counties in their respective districts. Facing budget cuts on the state level and a continuing drop in revenue from fines and fees in court, Rich approached the Mobile County Commission about increasing it’s allocation to her office in 2010, but when those talks proved fruitless, Rich filed a lawsuit based on those local statutes. After multiple appeals, the Alabama Supreme Court unanimously ruled in Rich’s favor last March, though the county quickly asked for a rehearing. However, that request was denied, and in August, the court reaffirmed its support of Rich’s interpretation of the law. What followed has been months of mediation between attorneys paid by the county and attorneys paid by Rich’s office that was almost unsuccessful, as the hearing before Elbrecht on Wednesday was initially scheduled as a bench trial. However, at the 11th hour, an agreement was reached providing Rich and her staff members with a settlement she claims “almost mirrors” the amount she requested from the commission before her lawsuit was filed. 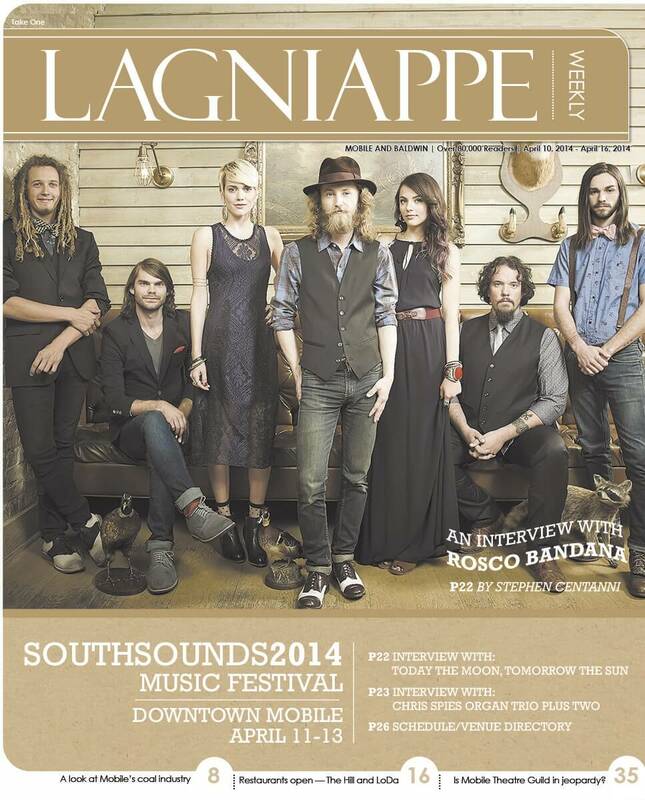 Between the years of litigation and months of mediation, the taxpayers of Mobile County will have put nearly $600,000 in this five-year legal battle, though Lagniappe is still waiting on final figures from Mobile County. As he has before, Elbrecht praised the work of the attorneys on both sides of the case, calling the agreement reached an “absolutely superb way of dealing with two out-of-date statutes” that he encouraged Mobile County’s legislative delegation to repeal in their upcoming session. 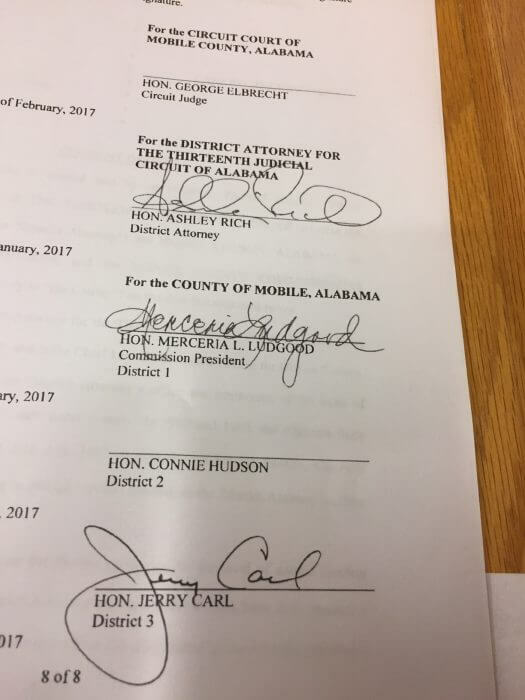 Elbrecht, of Monroe County, was appointed to the case after Mobile County judges recused themselves when litigation first began in 2012. 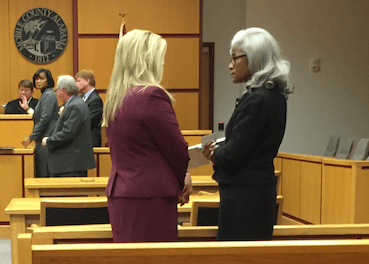 Till the very end, Commissioner Connie Hudson has favored continuing the county’s fight against a lawsuit filed over funding for local prosecutors. Missing from the page of signatures on Wednesday’s agreement was Commissioner Connie Hudson’s. While Carl has vocally advocated for a compromise in the past, Hudson and Ludgood have rejected previous settlement offers they found to be not in the best interest of the county and its budget. 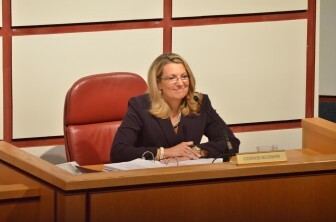 Hudson said she wasn’t opposed to the financial terms in the final settlement, but withheld her signature because it failed to include a “protection mechanism” that would keep the district attorney’s office on an equal footing with other county-funded departments if a “dire economic situation” caused the commission to implement across-the-board budget cuts. According to Hudson, such a provision was presented to Rich and rejected during mediation. In recent negotiations, there was been a disagreement over what an appropriate salary schedule would be for Rich’s employees. However, in the final settlement, a salary schedule is not mentioned, and the distribution of the office’s increased annual appropriation will be left to Rich’s discretion. Speaking with Lagniappe, Rich said additional funding will allow the office to raise its starting salary for assistant district attorneys from $45,000 to $55,000 and extend a 7-percent raise to existing staff members. The additional $1 million will, according to Rich, go toward paying off the remaining court fees from the lawsuit and subsidizing anticipated dips in revenues from fines, fees and court costs. However, while she called the settlement “a step in the right direction,” Rich added “it does nothing for the operational costs” in her office and wouldn’t provide the long-term funding to refill any of positions she’s cut over the past six years.